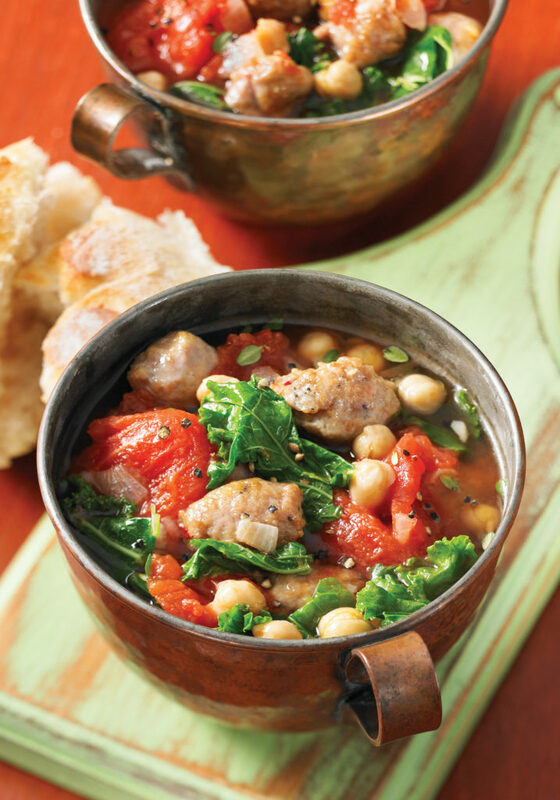 This hot and hearty soup makes for a cozy weeknight supper - serve it with crusty bread. I’m going to retire and live off my savings. Not sure what I’ll do in the second week. In a large skillet, heat a drizzle of oil over medium-high heat. Squeeze sausage out of its casing into the pan and cook, breaking it up with a spoon, for 3 minutes. Add garlic and onion; cook, stirring, until sausage is browned and onion is soft. Scrape into a 4- to 6-quart slow cooker. Stir in tomatoes, chickpeas, stock, thyme, hot pepper flakes, salt and pepper. (If the stock doesn’t fully cover the other ingredients, top it up with water.) Cover and cook on low for 6 to 8 hours or until soup is slightly thickened. Stir in kale, cover and cook for 10 minutes, until wilted. Tip: Change the taste of the soup by varying the type of sausages you use. Sweet Italian sausages or bratwurst will give the soup a mild taste, whereas spicy Italian sausages or chorizo will completely transform the flavor. If you’d like something lighter, try turkey or chicken sausages. Variation: For an even more substantial meal, cook up about 8 oz (250 g) of dried penne or other short pasta and add it to the soup before serving. Posted in Book Recipe Index P-Z, Slow Cooker, Soups, Salads & Dressings.